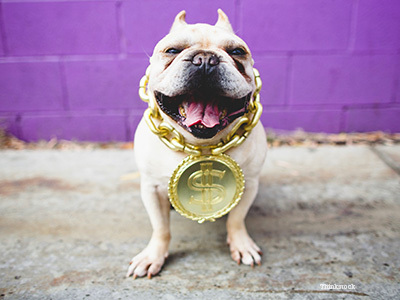 One way dog guardians try to save money is by declining dog insurance. This can be a devastating mistake. Did you know that repairing a torn ACL injury can cost you over $5,000 depending on which procedure is performed and where you live? What's more, not fixing a torn ACL can be devastating. Also keep in mind your dog has two knees! Dog insurance can literally be a life-saver as long as you choose the right plan. It’s heart-breaking to think of all the dogs that have been euthanized because their owners couldn’t afford the proper treatment. Even if you are savvy enough to purchase dog insurance, make sure that you know what your plan covers and how the plan works. Despite having coverage, you generally need to pay for veterinary expenses up front. You will then get reimbursed at a later date. Make sure you have a plan in place before you need it. It never fails. Murphy’s Law says that if you cancel your dog insurance plan after a few years of good health, an emergency will arise shortly thereafter. This actually happened to one of my clients this week, and the poor dog paid the price. The premium you pay will pale in comparison to some of the expenses you may incur. Do yourself a favor: once you get dog insurance, stick with it. Do not pick dog insurance based solely on cost. Cheap plans are cheap for a reason. Make sure you take into account the medical coverage and refund it provides. I’ve heard clients regret that they paid premiums faithfully for years, yet never benefited from a “return on investment” because their dog never got sick. This reasoning is the same as complaining that your house never burned down, although you’ve paid for fire insurance on your house for years! Dog insurance, or any insurance for that matter, is not an investment. It’s designed to provide piece of mind so that in case of an emergency, you will survive without taking a huge financial hit. Dog insurance is like any other policy: there are exclusions, pre-existing conditions and requirements. Before any insurance plan kicks in, there is a waiting period. This is the time periods you have to wait for benefits until your coverage starts. Educate yourself before you sign up: read the literature, visit the company web site and talk to representatives over the phone so that you have a full understanding of what you’re signing up for. There are some really good dog insurance companies these days, and some really bad ones. I recently heard of a patient who was declined coverage for a mass near the thyroid because he already had a slipped disc in the neck. The shady company claimed that the slipped disc caused the mass to appear! This is clearly science-fiction, and the poor dog and his owner were the unfortunate victims. Never forget that anybody can write anything on the Internet. While researching this blog, I read a comment by a very persuasive woman who claims that the company she chose is the best because it reimburses 50% of her veterinary bills. This is sadly, completely wrong. Some of the best plans out there are called “80-20 plans.” What this means is that you pay 20% of the bill, and the company refunds 80% of it – after your pay your deductible. Before you choose a dog insurance company, ask your veterinarian to share experiences with various companies. Every once in a while, a dog guardian will try to twist a veterinarians arm to tweak the facts, or omit findings. Yet cheating an insurance company is a big deal. It’s considered fraud and can get you into serious trouble. While pet insurance is great it’s important to keep in mind that it won’t necessarily cover everything. Generally, the more expensive a plan is the more it will cover. There are many, many options out there, so you will need to find the best cost/benefit compromise that suits your needs.